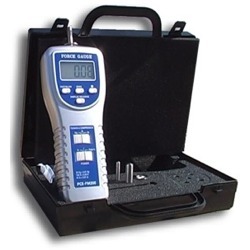 The PCE-PTR 200 penetrometer is very useful for testing the maturity of fruits. This digital penetrometer offers higher accuracy and resolution than any other analogue device. With the PCE-PTR 200 penetrometer you will obtain information not only about the optimum time for picking fruit, but about the progress of the fruit from the moment it was picked until it is consumed, including when it is being stored and shipped. The PCE-PTR 200 penetrometer, controlled by a microprocessor, is easy to read and can be fixed to an optional test position. It is powered by batteries or by a mains adaptor (300 mA power source available seperately). The display of the penetrometer can be turned at 180° to allow better visibility while taking measurements. To transfer data from the penetrometer to a computer, you will need the optional software pack with data cable. Data is transferred to a computer, using the software, at a rate of one reading every 2 seconds. 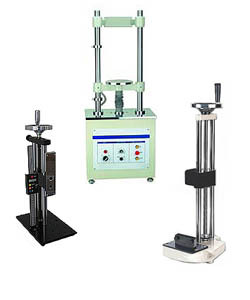 The test position is ideal for measuring in quality control and laboratory experiments. If there are any questions about this penetrometer PCE-PTR 200, please have a look at the technical specification below or call: UK customers +44(0) 23 809 870 30 / US customers +1-410-387-7703.. Our engineers and technicians will gladly advise you regarding the penetrometers or any other products in terms of regulation and control, or scales and balances of PCE Instruments. While talking about the maturity of fruit, it is important to distinguish between physical maturity and commercial maturity. Physiological maturity can only transpire while the fruit is still on the tree and it corresponds to the earliest harvest time for the sale of this type of fruit. Commercial maturity occurs later, and indicates the best time to consume the fruit, when its colour, flavour and texture are ideal for the consumer. In the case of the climatic fruit, the commercial maturity of the fruit can occur some time after it has been picked. While fruit is maturing, important changes occur inside, such as changes in colour, form and texture. It is necessary to obtain objective information with which you can follow the development of ripening and make decisions about when the fruit should be picked and processed (to determine the quality of fruit from the moment it becomes a product to its final consumption). 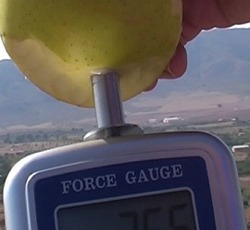 The firmness of the fruit, measured by the penetrometer, one of the most objective parameters in relation to the fruitsmaturity and as such is one of the most common techniques used in testing. There are also other methods that are used for example by the refractometer (this technique is proportional to measuring total sugar and thus the sweetness of the fruit). If you are looking for refractometers to measure the sugar content of fruit, you can find them at this link. 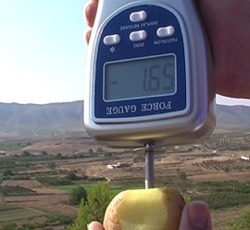 Generally, the firmness or hardness of fruit measured by a penetrometer decreases as the maturity process occurs. Of course, you have to take into account that the firmness of the same fruit can vary. it depends on fruit variety, the region where it is cultivated, its size or the temperature of the fruit when it is being measured by the penetrometer (the higher the temperature, the less firm the fruit is). (Range 0 - 1 kg. 6 mm). diameter sensor (Range 0 - 5 kg. 6 mm) or the 8mm diameter sensor. (Range 0 - 5 kg. 8 mm). diameter sensor (Range 0 - 13 kg. 8 mm) or the 11.3mm diameter sensor. (Range 0 - 13 kg.11.3 mm). (Range 0 - 20 kg. 11.3 mm). This digital penetrometer offers the best accuracy and resolution compared to analogue penetrometers. Aside from having three different penetrating sensors, it eliminates the need to purchase multiple analogue devices required to perform the same functions as this PCE-PTR 200 digital penetrometer. 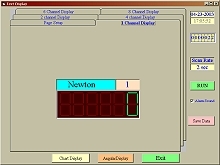 The penetrometer can transfer data at a quicker rate when transferring from memory to a computer, one reading every 0.25 seconds using Windows hyper terminal. View the value shown on the display of the penetrometer. Readings can be transferred to a computer by means of the RS-232 connection and software. The following link has information pertaining to the software pack. 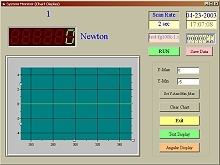 Software indicates the time interval in which the device shows and adjusts measurement values. It can be indicated digitally and with graphic curves. Software with the value curves for the penetrometer: Can choose between analogue or digital representation. 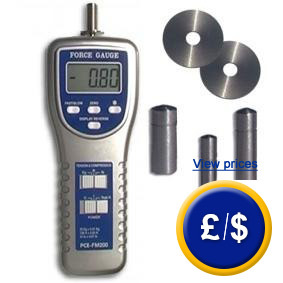 The force meter can be combined with any of the three test positions. Two test positions are equipped with a crank and one has a motor. The effective use of the test position is in daily testing of materials in a laboratory and you would like to maintain the same conditions, eliminating the possibility of human error. The technical specifications for the different positions are available at this link: Test Positions. Descriptions of test positions can be found within the corresponding on-line category: penetrometers. If you wish to take a perfect measurement of firmness, the penetrometer should be mounted to a fixed position to guarantee that pressure is applied slowly and evenly at a constant angle in respect to the fruit. The manual test position for the PCE-PTR 200 penetrometer is operated by a lever and offers the ideal solution. This also guarantees accuracy between the model and the device. It has screws for fine adjustements which ensures the best accuracy. There are hidden holes in the back of the penetrometer allowing the test position to be attached to the device.